Last year the Labyrinth was built! This year the Wall will be adorned! Together they are known as Nutmeg Designs and are collaborating on 9 signs using the "fruit of the spirit" from Galatians 5:22&23. The refereed to Wall is cinder block, 4 feet high x 22 feet long. The nine Fruit of the Spirit are love, joy, peace, patients, kindness, goodness, gentleness, faithfulness and self-control. 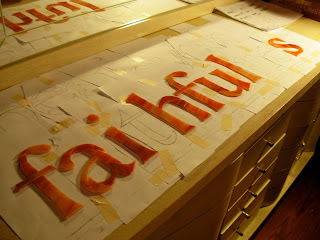 Wayne will be designing the letters and cutting them out of stain-glass, each word a different color. 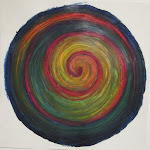 Margaret will then mosaic in and around each word with contrasting colors. Then I will be expanding the mosaic with shells, stones and tiles to fill out the 1 foot by 4 foot substrate on which the words are adhered. I am so excited as Wayne has already started on the longest word in orange - faithfulness! Stay tuned as this project progresses!